Understanding Laura: But it's a CUTE little chicken! But it's a CUTE little chicken! Brian: It looks like a chicken. Laura: But it's a cute little chicken! 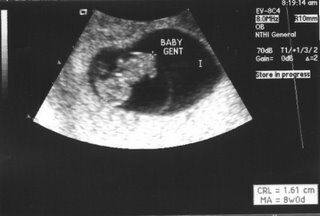 This is our baby's first picture. His/her head is on the bottom. The wing looking things are his/her nubs, which will soon be arms and legs. Baby Gent has a heart beat of 160. Super healthy and looking good. Much to my dismay, we are not due to deliver until the 25th of December. We had estimated a due date of about late November to early December. Luckily, only 5% of pregnant women deliver ON their due dates. I'm hoping for earlier, but this baby will come when he's good and ready. I am so happy for you and Brian. I hope that you too are really happy. Maybe we will be able to visit some time. that would be gr8! Heck yes it would! Thanks for the happiness! Awwwww how cute!! A christmas baby! I love him! He's the cutest little chicken ever! First, I can't believe you're a blogger and have been for awhile now. Second I can't believe you're living in ALASKA! Third, I can't believe you are pregnant!!! We, Miss, really have some catching up to do. Ryan! How can I call/write/whatever you? Do you have email or a blog or a phone? :) Email me at MrsBGent@yahoo.com with some contact info or post your blog link in a comment. Nice hearing from you! AGAIN!!! I think he looks like a tadpole! I hope hes big so i can teach him all about Football, hockey, and wrestling!! but judging by you an Brian i dont think hes going to be too big. lol. but i know one thing. hell be taller then his mommy!! lol. j/k Laura. have a good day!! love you guys! !